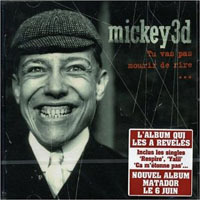 This page contains a translation into English of the lyrics to the popular French song "Yalil Yalil" (also sometimes known as "La Fin Des Haricots"), which was sung by the French ensemble Mickey 3D. Part of this song is in French, part in Arabic. Also included is a transliteration of the Arabic portion of the lyrics into the Roman alphabet so you can sing along if you like. The music video for this song is a beautifully-done animation showing a dancer performing to live music on the portions with the Arabic lyrics. There are many video clips of this which can be found by searching the Internet for the keywords "yalil" and "mickey 3d". Pour soigner son manque de chaud To deal with the lack of heat. * Literally, "C'est la fin des haricots" means "That's the end of the beans." It's an expression in French which is equivalent to the English expressions, "That takes the cake," or "That's the last straw," or "That's the limit." ** Literally, the word "crever" means burst, but it can also mean a slang word for "die", similar to how in English the word "croak" can be slang meaning to die. The French portion of this song was translated by Shira. The translation for the Arabic part of the lyrics was posted on tribe.net by Aicha.